Children’s historical books can serve many purposes. They can teach children about history, as well as develop emotion and empathy about figures from the past. In “Recreating the Past,” Evelyn Freeman and Linda Levstik argue that children’s historical fiction fosters ongoing process of historical interpretation in which the child is an active participant (pg. 331). From my own experience as a child reading historical fiction, fiction can also help the reader project into another world and develop a contextualized understanding about the past by thinking of one’s self as part of it. While we, as educators, historians, and theorists, recognize that historical fiction cannot be ingested uncritically, historical fiction still serves as an entry point into the past for many children in ways that are more colourful, creative, and emotional than traditional public history or curriculum. But I question whether children’s history books cultivate an understanding of the past as distinct unconnected experiences, which then act as a barrier for understanding more contextualized history later in life. In particular, with books that present “other” or “difficult” parts of the Canadian past, are these books serving as narrative interventions or intersections into the traditional stories of the nation? Or, in our use and reading of children’s history books, do we unwittingly create and ratify the distinction between Canadian history and “other” histories in Canada? 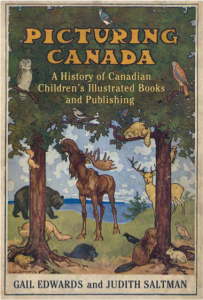 In a series of three posts, I will explore a selection of children’s books on particular topics of “other” histories in Canada. My intention is not just to critique children’s books, but to deconstruct the semiotics of the historic spaces that get created through this medium. The series explores how these histories are positioned in the nation and how we can use this understanding to enhance our teaching of contextualized and problematized histories of the nation. It was a CBC Indigenous post on children’s books about Residential Schools that first got me thinking about this topic, so I thought I would begin the series here. On September 26 2015, Chantelle Bellrichard published a post about 10 books about residential schools to read with your kids. 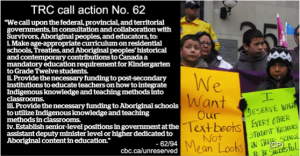 Bellrichard frames her list by stating that with the TRC’s recommendation on increased Indigenous content in the public school curriculum, especially related to residential schools, more students will be coming home with questions about residential schools and that parents can use these books to “open up space for the conversation” about these histories at home. Bellrichard draws on the expertise of Jo-Anne Chrona, a curriculum developer in BC who has been building age-appropriate curriculum materials for the First Nations Education Steering Committee (FNESC), to identify ten books for young people between the ages of 4 and 12 that address residential school experiences and that are recommended by FNESC and Project of Heart. Working from this list, I searched six large public libraries in Canada (Edmonton, Halifax, Montreal, Toronto, Vancouver, Yellowknife/NWT) with the keyword “residential school” and filtered the search results for children and/or youth. From this list of ten books, four of the books – Shi-shi-etko and its sequel Shin-chi’s Canoe by Nicola Campbell and Fatty Legs: A True Story and its sequel A Stranger at Home: A True Story by Christy Jordan-Fenton and Margaret Pokiak-Fenton – came up in all six library systems. In this search, all six of the libraries also listed When I Was Eight, a junior-level adaption of Fatty Legs, and the two 2016 publications: I Am Not a Number by Jenny Kay Dupuis and These Are My Words: The residential school diary of Violet Pesheens by Ruby Slipperjack. All the library systems also had Arctic Stories by Michael Kusugak, Kookum’s Red Shoes by Peter Eyvindson, and We Feel Good Out Here = Zhik gwaa’an, nakhwatthaiitat qwiinzii (The Land is Our Storybook) by Julie-Ann André and Mindy Willett, but these books did not show up under the “residential school” search term. Beyond these ten books, there were not many others that were consistent across the three library systems, although “Mush-hole:” Memories of a residential school by Maudie Harper, Red Wolf by Jennifer Dance, and Not My Girl , a junior-level adaption of A Stranger at Home by Christy Jordan-Fenton were also popular. Across all six library systems, the total number of books listed as “residential school” and “children,” were just under forty; thus, if parents are looking for books on this topic, these ones are available and accessible and act as a popular canon for how these stories can be shared at home. For my analysis, I focused on picture books for children ages 4-8 and read four books from Bellrichard’s CBC list – Arctic Stories, Shi-shi-etko, Shin-chi’s Canoe, and We Feel Good Out Here – as well as When I Was Eight and “Mush-hole:” Memories of a residential school. I wanted to focus on picture books because of the way they are “multimodal” and tell a story through text, illustrations, and design. All of the books I looked at were beautiful and honest and grounded in appreciation for land, tradition, and family. They were all written by or with Indigenous people, often times by survivors themselves. The books demonstrate individual resistance, determination, strength despite, and in spite of, pain and trauma and were often positioned in a forward or afterward as being told as part of the healing process. While many children’s history books are individualized accounts about what one did in history, these books were about the effects of being acted upon and provided agency and respect for the characters and the lessons they could teach. Across all six books, there were some commonalities. First, these books showcased the story of an individual, not of a theme – a common element of historical children’s literature. Arctic Stories, for example, follows “Agatha” in three different narratives; the final one being “Agatha Goes to School,” which begins with Agatha and other children being picked up from Repulse Bay to go to Chesterfield Inlet for school. When I Was Eight, a junior-level adaptation of co-author Margaret Pokiak-Fenton’s experience at residential school in Aklavik, NWT, is told in first-person with the lead character introduced by her given name, Olemaun. We Feel Good Out Here follows Julie-Ann André, a Gwichya Gwich’in woman from Tsiigehtchic in NWT, as she introduces the reader to her family and her land of Khaii luk, which part of the Gwich’in traditional lands in NWT. A two-page spread acknowledges Andre’s childhood growing up in a residential school; an experience that “townized” her so that she was “no longer comfortable in [her] own culture or with who [she] was” (pg. 8). Shi-shi-etko and Shin-chi’s Canoe follows siblings “Shi-shi-etko” and “Shin-chi” as they individually explore the meaning of residential school in lieu of their traditional learning about the land. “Mush-hole:” Memories of a residential school follows an unnamed narrator as she recalls going to residential school, the negative repercussions of her life because of this experience, and her way toward spiritual healing and back to traditional knowledge. The stories also had similar narrative themes: a beginning and end located in land, family, and spirituality; an emphasis on being taken from family and upon arrival hair was cut off, names changed, and a ban on speaking first languages; the presence of Christian religion and a standard and harsh routine that wiped away individuality; and references, rather than foci, on the brutality and trauma of experience. In When I Was Eight, for example, the narrative explicitly follows a “hero’s journey” with the heroine pushing through obstacles to get the “grail” of reading in English and being able to connect this knowledge with traditional learning. Shin-chi’s Canoe ends on a happy note but there is a lingering sense of absence. In its discussion of seasons as a marker of time, the reader has an understanding that this season will end and the seasons of school will remain. These commonalities among the six books are not surprising given that a standard element of historical fiction is to create a resolvable narrative for the reader that is both expected and understood (Barton). The books that referenced life after residential school, like “Mush-hole” and We Feel Good Out Here, also explore difficulties and the alien nature of going back home, being confused about who one was at home in lieu of their experiences at the schools (note: Not My Girl and A Stranger at Home by Christy Jordan-Fenton explore this topic directly). Taken together then, for young people developing an image in their mind of what these experiences and this period in history was about, they would learn that children were taken from the land to go to a harsh school with means nuns. Young people would learn that these children or their parents really did not have any choice in this decision and as a result of these schools, the children had to struggle to maintain, retain, or contain who they were before this experience. To draw on the TRC’s Calls to Action, these books can thus serve the purpose of being “age-appropriate curriculum on residential schools, Treaties, and Aboriginal peoples’ historical and contemporary contributions to Canada a mandatory education requirement for Kindergarten to Grade Twelve students.” In the process of truth telling and reconciliation, children become exposed to the sadness and violence of residential schools, but learn that these experiences can be, and have been, overcome with a return to traditional teachings grounded in connection to the land and to each other. The lasting impression of these books is that for these individuals and others like them, they are more than what happened to them and their grounded strength is stronger than institutionalized might. However, while all the stories are unique and interesting, if one was to read all of them, the experience of residential schools feels very narrow and distant. In these stories, children are taken from their community – usually depicted as existing in nature – to a larger, more institutional building – also placed beyond Canadian society. Nothing in the images suggest a temporal or connectedness to the nation at large, such as train tracks, towns, farms, or any other cultural triggers that would provide a sense of connectedness for young people today. Arctic Stories is the only book that mentions institutions that young people across Canada would recognize, such as HBC and RCMP. “Mush-hole” is the most grounded in the history of residential schools and its effect on today, with the first line situating the narrator’s experience within history – “I think it was about 1914 when they started taking children to residential schools” – and a later illustration showing the narrator as an adult in a city. What is also missing is a sense of responsibility and accountability by or for the Government of Canada. Across the stories, the church is the enemy, with explicit and clear graphics of crosses, steeples, and ominous individuals in black robes drawn from below with sharp and pointed features. In Suzette Youngs’ study of picture books in the classroom, she found that 61 percent of the conversations about the books were in response to visual images (382). 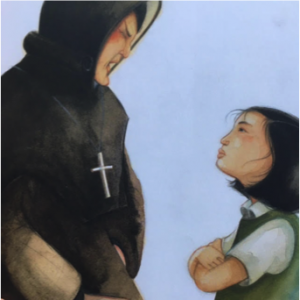 Thus, the prominence of images of church-as-enemy means that for children interpreting what they see and read about residential schools, it will be the church, nuns in particular, which will be remembered as being to blame for these experiences. However, if non-Indigenous young people are going to grow up and take part in truth-telling and reconciliation practices, then they also need to have an understanding of how residential schools were legislated and enforced by laws, policies, and the Government of Canada. They have to understand that laws don’t always protect us and that the government is not neutral in creating and implementing policy. Granted, these books were written prior to the Truth and Reconciliation Commission, and thus were not written to explicitly address the recommendations as laid out in the final Report, which does places clear responsibility on the Canadian government. However, in drawing on the work on cognitive constructions of history, what is clear is that without making connections to the nation at large there will be difficulties in understanding residential schools as a nation-building project. This then could mean that young readers could grow up with an understanding of residential school stories as sad and deserving of empathy, but not as foundational to the Canadian nation and how it has developed. This spilt will become a problem in the ongoing process of truth-telling and reconciliation. The purpose of this post was not to critique or criticize these picture books. All six of them were beautiful and honest stories about residential schools based on the experiences of survivors and deserve to be shared in homes and in classrooms. The purpose of this post was to understand the images that children may form about residential schools based on popular children’s books so that educators may develop a grounded understanding of young people’s prior or enhanced knowledge about these histories adjacent to their formal learning. It is important to understand how these early engagements with historical topics shape how one understands the past so that we, as educators, historians, and parents can use our platforms of teaching and learning to expand, dissuade, or enrich them. Dr. Samantha Cutrara is a History Education Strategist and is currently working on a manuscript for UBC Press entitled Creating a New “We”: Canadian history education for the 21st century. Find more information about her consulting and academic work on her website SamanthaCutrara.com. Freeman, Evelyn B. and Linda Levstik. “Recreating the Past: Historical Fiction in the Social Studies Curriculum.” The Elementary School Journal, Vol. 88, No. 4 (Mar., 1988). Pg. 329-337. Wertsch, J. V. “Is It Possible to Teach Beliefs, as Well as Knowledge about History.” In P. N. Stearns, P. Seixas & S. Wineburg (Eds. ), Knowing, Teaching, and Learning History: National and international perspectives. New York: New York University Press (2000). Pg. 38-62. Youngs, Suzette. 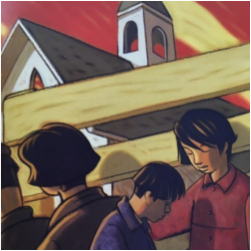 “Understanding History through the Visual Images in Historical Fiction.” Language Arts, Vol. 89, No. 6 (July 2012). Pg. 379-395. The author would like to acknowledge that this work was created on land that is the traditional territory of the Haudenosaunee, the Métis, and most recently, the territory of the Mississaugas of the Credit River. The territory was the subject of the Dish With One Spoon Wampum Belt Covenant, an agreement between the Iroquois Confederacy and the Ojibwe and allied nations to peaceably share and care for the resources around the Great Lakes. This territory is also covered by the Upper Canada Treaties. Today, the meeting place of Toronto (from the Haudenosaunee word Tkaronto) is still the home to many Indigenous people from across Turtle Island and the author is grateful to have the opportunity to write, study, teach, and learn in the community, on this territory. As a teacher librarian, I use these books as starting points to conversations about government actions and population attitudes then and now. My goal is for students to go beyond just ‘knowing about’ to providing opportunities for children to actually do something. Resultant student actions have ranged from sadness to raising money for Books for Attawapiskat, letter writing regarding water crises and Amnesty International’s causes for Youth Activists. I am sure some students take part because they feel they have to. However, being exposed to other children who are ‘doing something tangible/concrete’ and contributing perhaps as followers, surely is better than doing nothing at all. I’ll be sharing your article with staff in the new year when a colleague and I walk them through a role play regarding Canadian Indigenous people’s history from first contact with Europeans through to Truth & Reconciliation.